You are about to complete the studies on the local school for adventurer. After years of learning and lots of sweat you take the final examinations. If you pass the tests, you can hit the road to exercise the learned. Your reputation in the guild of adventurers depends on the number of treasures you bring back. You travel to many destinations. Only the fittest survive. Depending on your skills and strength you may be able to master the numerous risks. The village Golmbach is the home of the adventurer. There's a shop for adventure requirements, a bank for your account, some places for one's leisure time and the travel agency. The travel agency is the starting point for your way into the far world. Ya3dag has a built-in "what you see is what you get" level-editor and has been specifically designed for rapid level creation. Note that Ya3dag is a standalone game. The releases include everything the game needs. Ya3dag runs as Quake2 modification in order to show it's roots. Integrated level editor, terrain modification, object placing, lights, waypoint. Smart NPC's, each quake2 or quake3 player model can be used. Day and night change. Rain, snow, lightning and clouds. Ya3dag is a 32 bit application but runs on 64 bit systems too. as feedback for the next update to me. This article is an excerpt from the manual of IqeBrowser V2.15. Sometimes there is a need to exchange 3D data with an other application. In this case OBJ (wavefront object) is the appropriate file format. IqeBrowser reads/writes this file and also many other applications. A good use is skin painting for models created with the model creator. system is our reference. See the chapter ‚Orientation of the coordinate system‘. Sculptris is a Freeware 3d Sculpting Application. It allows to simply working with 3d objects like with Clay and has a very User friendly Interface. Sculptris has also a paint mode to draw image- and normalmaps directly on the 3d object. Recommended use: Skin painting, model creation or modification. The preferred model orientation for IqeBrowser: model looks towards the positive X. The preferred model orientation for Sculptris: model looks towards the negative Y.
clockwise around the Z-axis before saving the model. Sculptris now can use it‘s symmetry feature for sculpting and skin painting. degrees counterclockwise around the Z-axis after loading. Switch on the Sculptris checkbox ‚Show advanced tools‘ (paint mode). and height) to load a image with the ‚OPEN TEXMAP‘ button. The ‚SAVE TEXMAP‘ button saves the texture (I know now other way to save the texture). Unfortunately, the OBJ files stored by Sculptris models have no material file attached. ‚Mesh/Parts‘ and enter the texture file name into the ‚Material string‘ input field. If the model looks bat shaded after loading in IqeBrowser, the normals are not OK. Either set the IqeBrowser setting Tools/Options/Import/Normals to ‚All faces‘ or (after loading the model) open the Tools/Mesh/Model settings/Normals and select ‚All faces‘. IqeBrowser can reduce triangle counts. See Tools/Mesh/Mesh filter. A freeware tool for manipulating 3D meshes (objects). Meshmixer is state-of-the-art software for working with triangle meshes. Do you need to clean up a 3D scan, do some 3D printing, or design an object that "fits" something else? Meshmixer can help. Think of it as a sort of "Swiss Army Knife" for 3D meshes. Use the IqeBrowser tool ‚Mesh/Transform‘ and rotate the model 90 degrees counterclockwise around the X-axis and 180 degrees around the Y-Axis before saving the model. Also use the IqeBrowser tool ‚Mesh/Transform‘ and rotate the model to your preferred orientation. No problems with textures. Both applications deal with material files correctly. 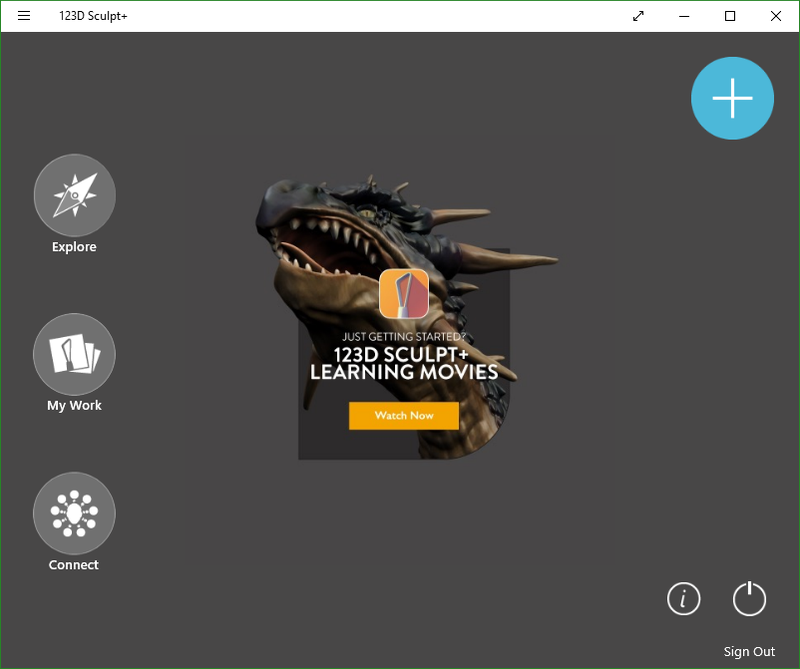 123D Sculpt+ is a digital sculpting application allowing beginners to get into digital 3D sculpting and professionals to do their work on the go. Simple to learn and powerful not only in professional hands. Design your creation, then add detailed features or paint on skin, fur, feathers. Whatever you imagine. Export your finished sculpture as an image or 3D model and 3D print into a real sculpture! Recommended use: Model creation (skeleton based, fast creation). 123D Sculpt+ can‘t import OBJ files. Open the .zip file and extract the files and load them with IqeBrowser. No problems with textures. 123D Sculpt+ deal with material files correctly. Next release. Mirrors for Ya3dag. And again, the next version of Ya3dag in work. A highlight of the next updates will be mirrors, portals, and reflective water surfaces. Ya3dag V2.03 source code, tools and libraries. All you need to build Ya3dag. Reworked load/save of voxel levels. More blocks. Reworked biomes. Ya3dag V2.02 source code, tools and libraries. All you need to build Ya3dag. Feature of this version are Minecraft-like fluids. Ya3dag V2.01 source code, tools and libraries. All you need to build Ya3dag. Enhancements of the voxel environment. New cows. Sheeps. More recipes. pleas port this game on android or psp!!! The psp can not handle this game. Well maybe i mean quake 2 was ported to it. It is really for Quake 2? Ya3dag is a standalone game. The downloads include everything the game needs to run. Ya3dag is based on Quake2. It is shown here at ModDB as Quake 2 modification so that its roots are visible. Alien arena has a modified Quake 2 engine. The game is not posted in moddb as mod, but as game. You can do that too. In order to let people know that the engine is "id tech" 2 based, you can write that in the description. What's with the frame rate?, what specs do I need? The major framrate consumer is the reflective water surface. Switching this off (in the video settings) will double the framerate for some scenes.